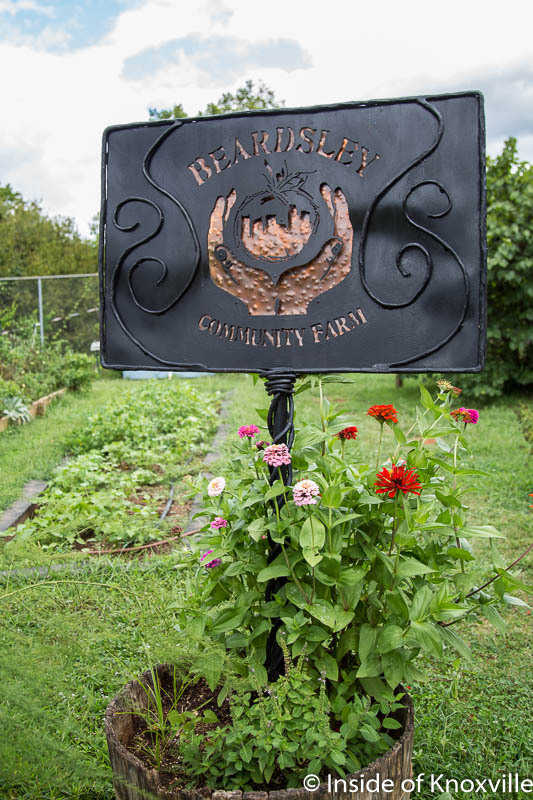 I’d always intended to make it to Beardsley Farm*. 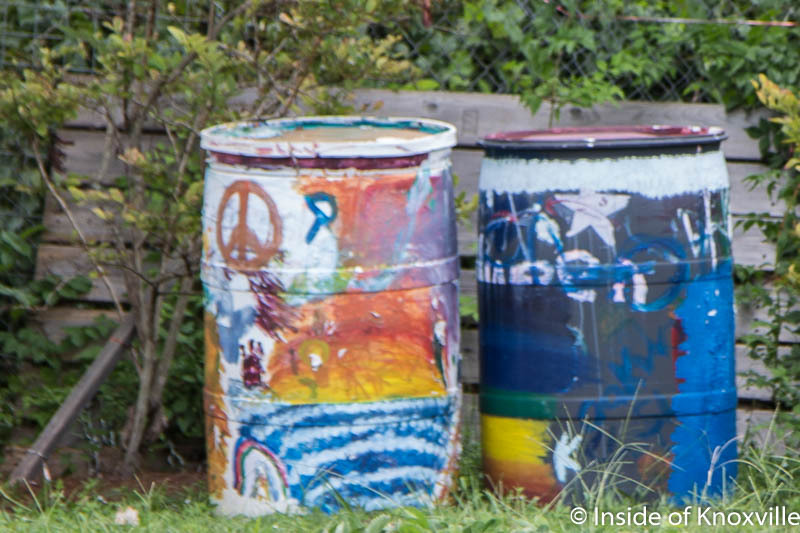 I heard it was close to downtown and I knew enough to know they do good things. But I didn’t really know exactly where to find it until I stumbled into it on the backside of Knoxville College as I was preparing an article about the college a few months ago. 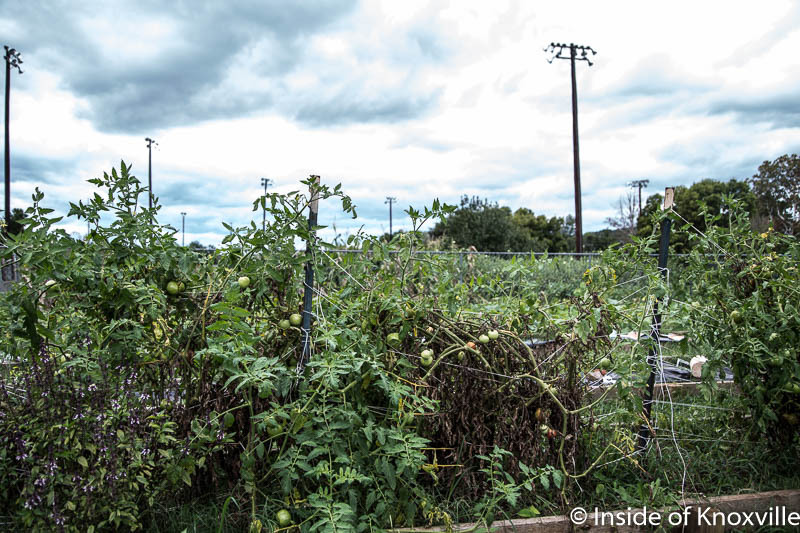 I’d later learn it was originally the farm for the college back in a day when they grew the food for their students. Directed by Khan Chov, it was Farm Manager Charlotte Rodina who took me on a tour of the grounds. Rather than massive fields of crops, the spot utilizes virtually every spot in its five acres to produce about 10,000 pounds of fruits and vegetables each year. 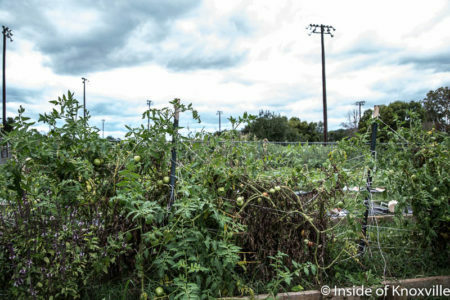 Aided by about 2,000 volunteers, the entire production of the farm is donated to food groups. Along the way, they sponsor “Farm to Table” dinners, such as their “Raise the Roots” dinner, produced for each of the last seven years, which raises money for operating expenses, providing for seeds, plants, tools, salaries and more. They also produce a Winter Solstice Dinner and a Summer Solstice Dinner. 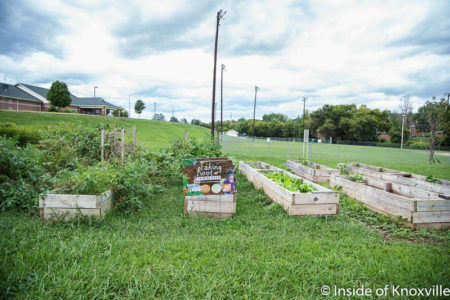 The dinners also serve to augment their goal of educating the public about food; what it is, where it comes from, how it arrives on the table. 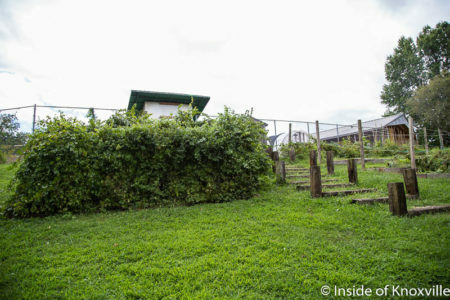 The farm itself actually includes a number of components and concepts. 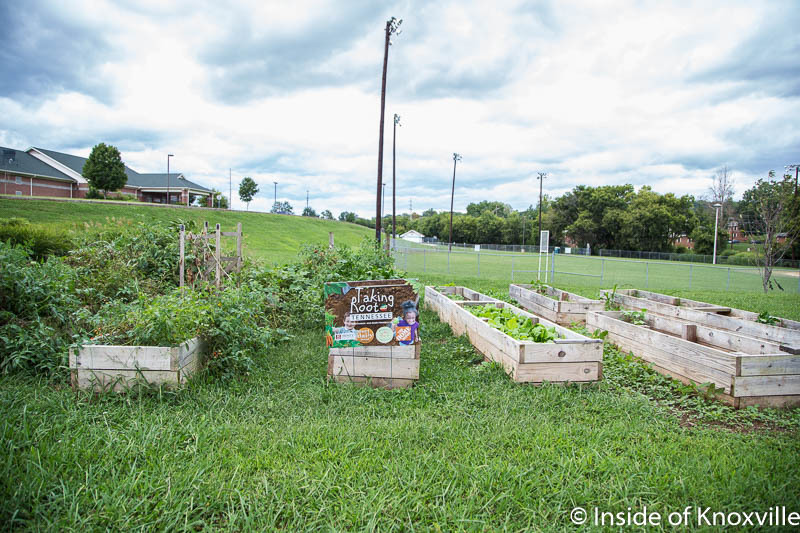 Originally formed to address the presence of a food desert in the Mechanicsville area, community members have access to a personal plot on which they may grow fresh vegetables of their own with assistance from staff. Interestingly, at this point, the farm attracts a number of Burundi farmers from Knoxville’s immigrant population. Residents may also work in the crops for shares of the produce. 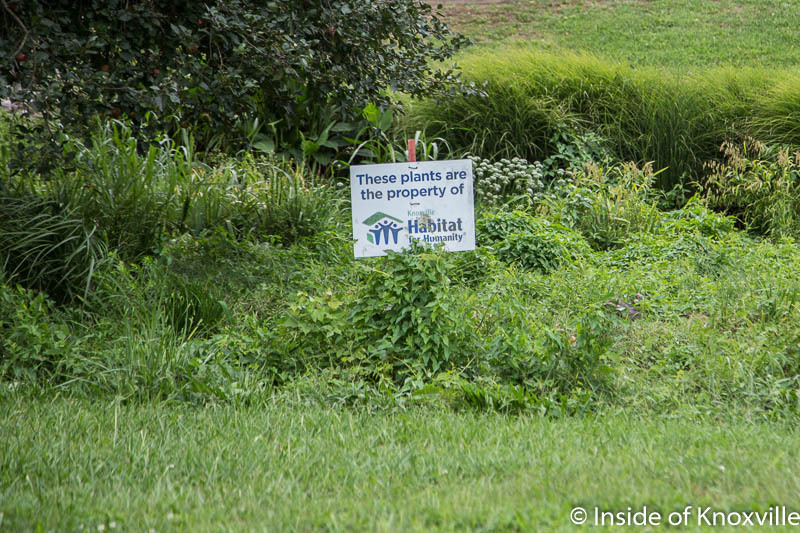 You’ll also spot a plot of decorative plants grown by Habitat for Humanity for use in landscaping the yards of the homes they build. 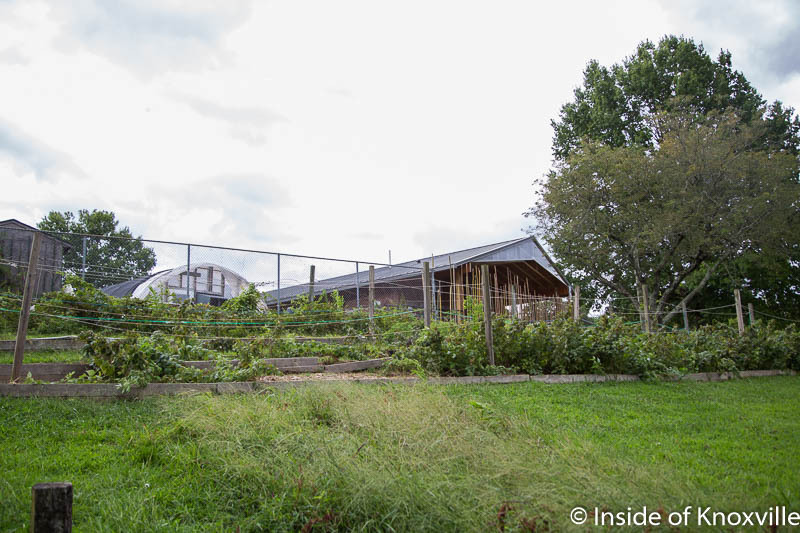 The farm also provides educational opportunities on topics such as nutrition, cooking and organic, sustainable farming practices. 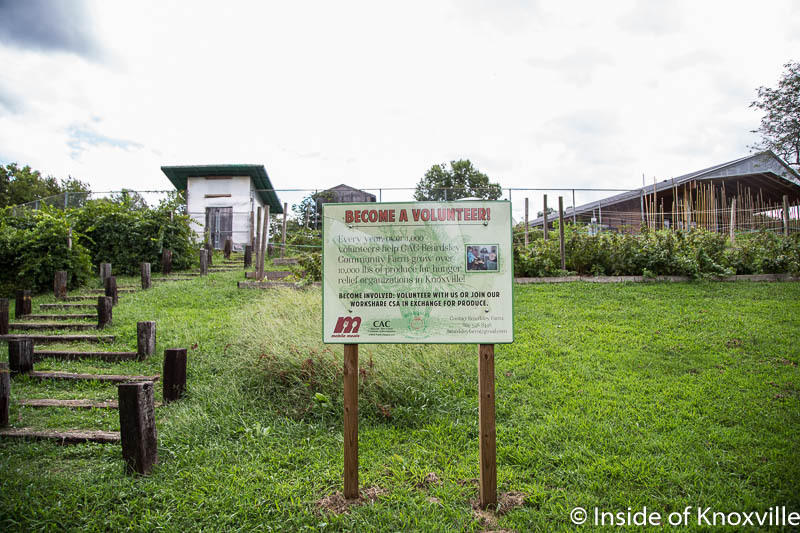 Agriculture, business and nutrition students from both UT and Pellissippi State provided volunteer support on the non-profit farm. UT architects assisted with design for their current building and the city, which owns the property, helped with funding. 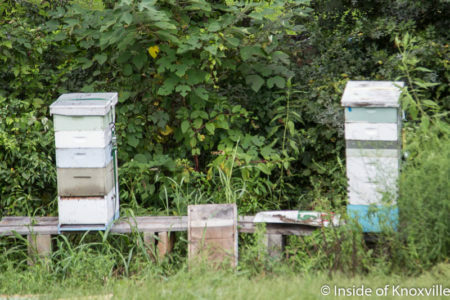 Growing a wide range of food including blackberries, blueberries, muscadines and all manner of vegetables, you’ll also find fruit orchards, chickens and honey bees. 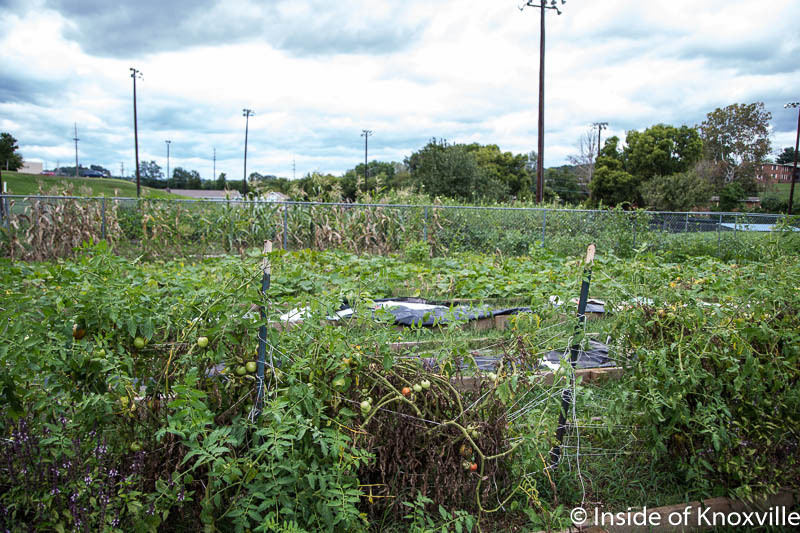 The farm rotates crops to care for the soil and makes the most of the amount of land they have. They practice not only organic practices, but look to be sustainable in every way possible, such as capturing rain water in a series of barrels and a roof drainage system. 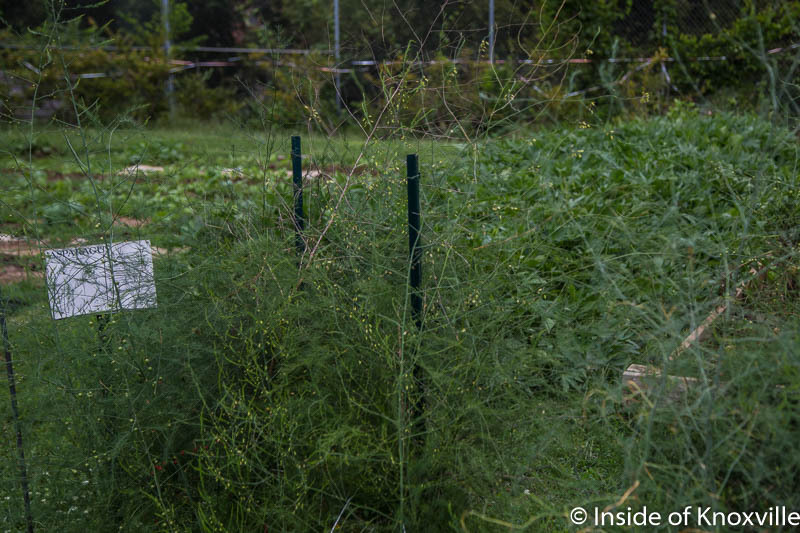 Over the course of their rotation, they produce about 100 varieties of fruits and vegetables. So, what is the cool urban dinner alluded to in the headline? 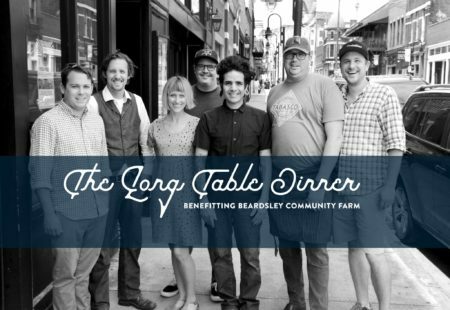 The farm will provide a number of vegetables to the first annual Long Table Dinner. The location of the long table is the coolest part: On September 24, a long table will be placed in the middle of Central Street in the Old City. Stretching approximately from Crown and Goose to Old City Java, a number of restaurants have come together for this fundraiser for Beardsley Farm. Chef Paul Sellas from Crown and Goose, Chef Jeff Dealejandro from Oli Bea, Shuan and Meg Parrish of Old City Java and Wild Love Bakehouse, Matthew Cummings from Pretentious Beer Company and Thomas Boyd with sommeliar Matt Burke from Old City Wine Bar will join forces to present a five course dinner that will be something to remember. Beardsley Farm will furnish acorn squash, peppers, tomatoes and more for the main courses. You’ll also enjoy their paw paws. Don’t know what that is? That’s just one thing you’ll learn that night. Fresh pears from the orchards will be utilized by Meg Parrish for dessert. As if all that isn’t enough, there will be an auction and entertainment. I recently attended a cooperative dinner between chef Dealejandro, Sapphire‘s Patrick Joyce and PostModern Spirits. It’s a fun communal experience and everyone involves pushes to make each dish and each drink be as outstanding and sometimes surprising as is possible. It’s a chance to see the very best of our local culinary scene, which seriously come into its own in the last few years. This dinner not only does all that, it gives you a chance to enjoy a meal with about a hundred of your friends on a city street in a beautiful time of the year. Best of all, it’s an opportunity to support a small group of people making a big difference in our city at Beardsley Farm. You’ll find tickets here and I hope to see you there. *For a complete podcast interview with Jake Reser of Beardsley Farm and Jeff Dealejandro of Oli Bea about the farm and the dinner, click here. 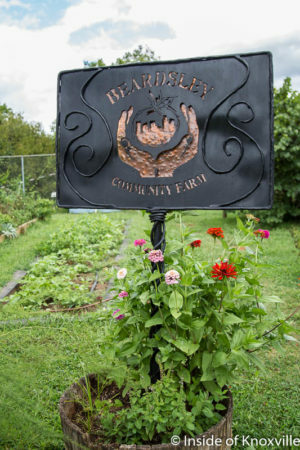 I love Beardsley’s dinners and Moxley Carmichael has been proud to sponsor a number of them. 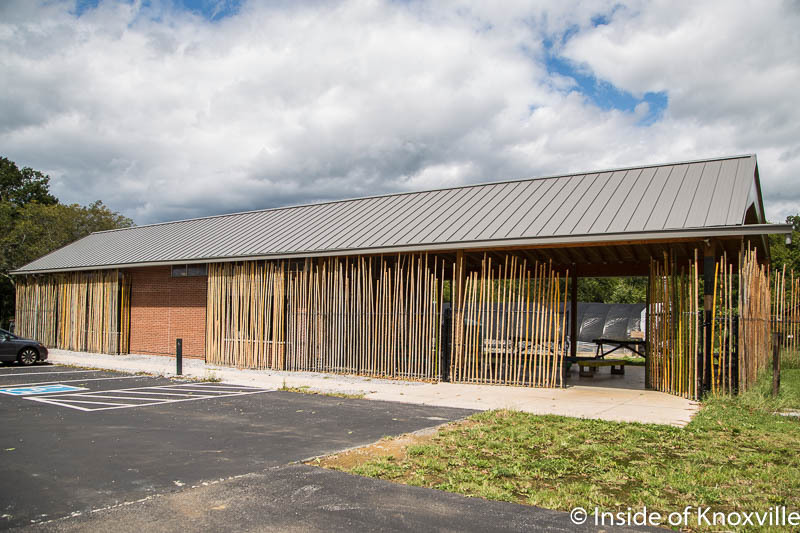 It’s a shame that this one is scheduled on the same night as “Evening Under the Stars,” another outdoor dinner benefiting the Knoxville Jazz Orchestra, a great organization we also support. There is a calendar located at EventCheckKnox.com that was designed specifically to help event planners avoid such conflicts. I guess it’s a good thing that there’s so much to do in our fun town. 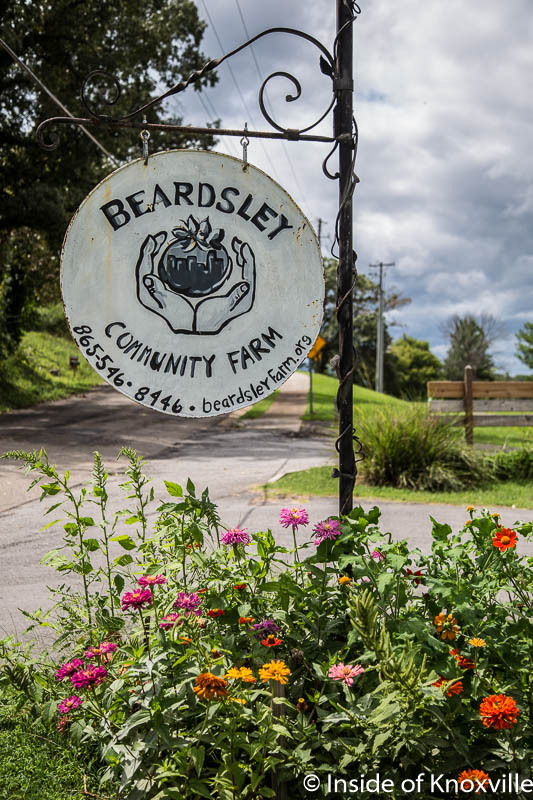 Beardsley Farm is a real asset to Knoxville. The dinners are the real deal.